People ask us about superfatting all the time. This Soap Queen TV video is a good place to start – Bramble Berry CEO and Founder Anne-Marie explains what it is around 3:26. Soapmaking is a science at heart. When you add color and fragrance, it turns into an art. Each oil has its own saponification value, or the amount of lye it takes to turn 1 gram of oil into 1 gram of soap. When we make cold process soap, it’s a mathematical formula that looks like this: (oil amount) x (SAP value) = lye amount needed. Find a list of SAP values in this post. An example is (10 oz. olive oil) x (.134) = 1.34 oz. lye. So, it takes 1.34 ounces of lye to turn 10 ounces of olive oil into soap. Using the exact amount of lye you need to make the exact amount of soap with nothing leftover is a 0% superfat or lye discount. Many makers like to have some leftover oils in their recipe that aren’t bound to lye, which can be anywhere from a 1-20% superfat. There are a few ways to calculate superfat. The easiest method is to plug your recipe into the Lye Calculator. All you have to do is select the percentage you want and it will calculate for you. You can also use the following equation: (1 – % superfat you want). So, if you want to superfat your olive oil soap in the above example by 4%, it would be: (1.34 oz. lye) x (1 – .04) = 1.29 oz. lye. You can also simplify that – for a one pound batch of soap, a 5% superfat works out roughly to 0.8 oz. of extra oils per pound of soap. We almost always superfat our recipes at 5% because it adds luxury to the soap without making it too soft or inhibiting lather. That said, superfat is a totally personal thing. Some soapmakers go up to 15% and swear by it. It also depends on the recipe. For instance, we recommend superfatting coconut oil soap at 20% so it isn’t too harsh on the skin. Experimenting with a few different superfats is the best way to find the amount you love. This Coconut Oil and Annatto Soap is superfatted at 20%. Great article! Just curious if these percentages work with melt and pour soap as well? I would like to make a facial bar, but want to experiment with adding oils to the MP base. Is there any advice or an article about this? Thank you! 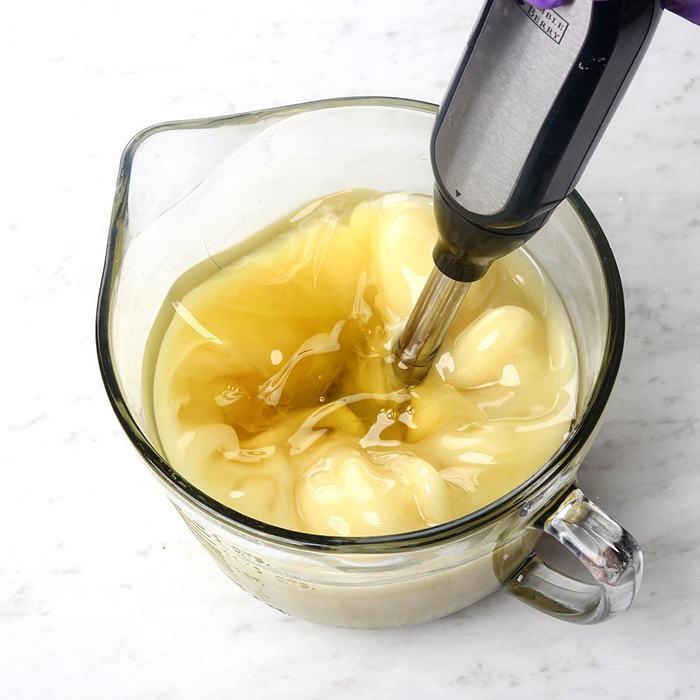 Melt and Pour tends to get too soft if you add additional oils to it. For us, our recommended amounts is 1 teaspoon per pound with SFIC branded bases and 0.5% with Stephenson branded bases. We are still working on getting all of the oils added back to our updated Lye Calculator. Thanks for the information given.I am a new soaper I learned a lot from you. How do you figure out the 20% super fat that a salt bar needs. Your calculator only goes up to 10. My math skills are not that great. Could you add salt bars to your calculator? 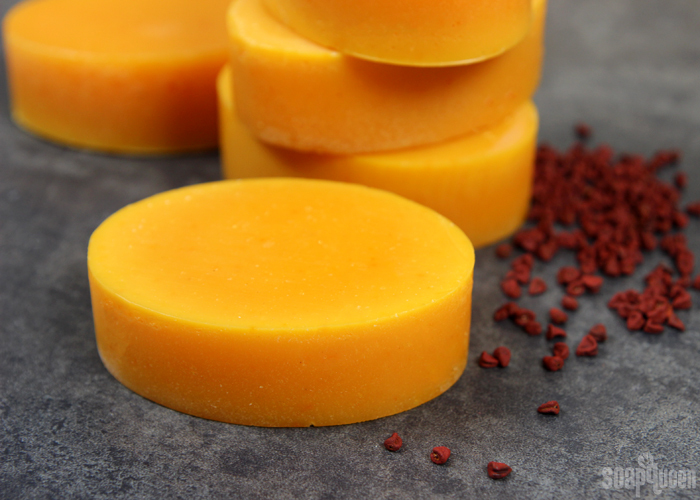 Find out how to calculate for a higher superfat in our 100% Coconut OIl & Annatto Soap Tutorial. We went for a 20% superfat in that recipe as well. How do we make sure that TFM (Total fatty matter) is above 80%? Is there any formula is calculate it? For a soap recipe using 80% coconut oil , how much of superfatting is advisable? Will it change if I add salt to the recipe? Is it ok to create a base with zero % superfat, run this through the lye calc, mix to light trace and THEN add a superfat oil? It seems this way you can control what the superfat oil is? Or do I need to include the superfat oils in the lye calc, and mix with the other oils prior to adding the lye, this way I imagine the superfat would be a combination of all your oils? You can do that and superfat at the end with whatever oil you choose. Though keep in mind that the Lye will most likely still pull a combination of oils to saponify and leave behind since it will normally saponify what is most readily available in the recipe. What superfat % do you suggest for a shampoo bar? My recipe has coconut oil, olive oil and canola oil, I was thinking I’d make them all equal parts, unless you suggest differently? We normally stick to about a 5% superfat for shampoo bars as well. I would like to make a 100% coconut soap for laundry – what superfat % would be good for getting stains out and also not too harsh on/ok for my hands ? Hi, Im starting to develop my own soap because i seem to be having some allergic reactions to coconut oil soaps… That being said, the recipe i have does not have any coconut oil, but i saw above in the comments that some of these people are doing upwards of 15-20%. Is this typical? Will a 2% superfat be too harsh for the skin? People who use a lot of coconut oil in soap tend to have a higher superfat because coconut oil can be harsh on the skin. Generally, a superfat will make the soap less harsh. Most of our recipes are formulated at a 5% superfat, but you can do a 2% superfat. The oils really determine what kind of superfat will be best for the soap. What oils are you using? 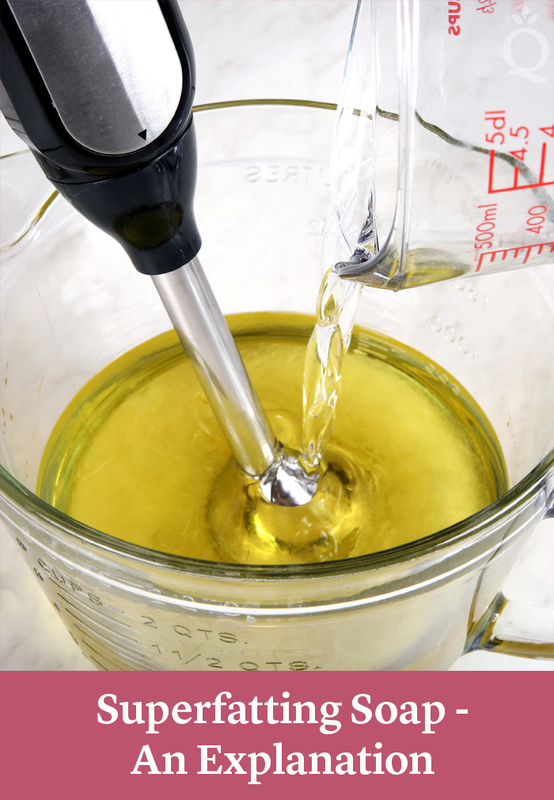 I don’t know if this has anything to do with superfatting but would it be okay to take out a portion of base oils to disperse other ingredients, add lye water to remaining base oils ad then add the oil mix later? Just because I want to add menthol to my soap and from previous experiences I found that to dissolve the menthol you need a decent amount of oil and I really don’t want to superfat my soap too much. Or would adding menthol to the base oils before the lye water be a better approach? You can take the base oils out, dissolve the menthol crystals and then add the oil mixture at trace. You could also try dissolving the menthol crystals in the base oils before mixing with the lye water, but I’m not sure if they will accelerate trace. You might want to try making small test batches to see which method works best for you. Would the medicinal effect of the menthol be stronger in either of those processes? We use the Menthol Crystals for the scent and cosmetic uses. We are not able to make medical claims so I’m not 100% sure about that. How to correct a too much superfatted soap by mistake? Hi, I’m not new to soapmaking, been doing it for the past 10 years. Made a …$%! *& mistake this week by adding not enough lye to my recipe. Luckily I note all my ingredients as measure and pour so I was able to spot my mistake. Changed my usual recipe so there goes the confusion. I used 472 g of lye when I should have used 672g… I’ve calculated my percentage and it comes down to 26% superfat! It’s way too oily to be used. What can I do, I’ve 10 pounds of the stuff! I know somebody from Brambleberry will offer advice too, but my advice is let it sit several days, retatch it and let it cure about 8 months. I got some bad lye so I can’t calculate the superfat, but it was WAY too high. Two days after the pour, the layers separated and the whole thing had runny oil. I cooked it on the stove to incorporate everything, put it into the mold again, waited one week and cut it. It was still way too soft to use, but I thought the very high fat content may be good for a WV winter. The soap did eventually harden enough to use and the very high superfat was great for winter skin. I have one bar left one year later and it’s almost as hard as a normal bar. By winter, it may be perfect. My suggestion, rebatch it and be VERY patient. Thanks! I guess I have no choise, I can’t sell the stuff so the whole family will get winter skin soap! Thanks for the tips Eric, that’s what I would recommend as well. You can also add equal or double amounts of a hard recipe when you rebatch it to make the bar more balanced and shorten the cure time. Loved the explanation and questions. i have learnt so much from you all tonight. Just wondering what INS stands for? Hi, and thanks for all this great information. It seems to me that superfatting with different oils would yield different results. For example, wouldn’t a surplus of Shea butter create a richer soap than adding more coconut oil? I don’t know if this is true, I am asking if anyone knows from experience if the same percent of superfatting with a different oil will tend to yield different moisturizing qualities. I’d also very much like to know the answers to these questions! Shea Butter is more moisturizing than Coconut Oil so yes, the superfat would feel different. But Lye is not going to not saponify the Shea Butter over the Coconut Oil or vice versa, it is an equal opportunist saponifier and there isn’t really a way to 100% have one oil be what is superfatted or not. The shelf life of your soap will remain about 1 year as the actual oils in the soap will spoil before it grows mold, yeast or fungus. The pH is too high to allow for that to happen. sorry that should have read (maybe with more coconut) you need a higher SUPERFAT blonde moment!! With reference to the comment you made about Kevin Dunn, could you please post a link to this? Also, some soapers are superfatting at 2% and some up to 15%, but does this affect the final pH? If there is no “free” lye left in the soap, I assume that the pH would be the same regardless of the superfat, as long as there is a superfat. Also, I think that if you make a very conditioning soap recipe with a low superfat or a less conditioning bar (maybe with more coconut) you need a higher pH. Personally, I always look at the INS end value. Commercial soap manufactures aim at a INS of 160. It is impossible to register an accurate pH with papers, you must use a professional meter. There is no link to it. It was a verbal comment at a Soap Guild show maybe 5 (?) years ago. I’d love to have a link! But if you find something else out in your research, let me know. I always recommend a cure time of a minimum of 3-4 weeks even with that information. I haven’t tested it but I’m guessing that the 2% versus 15% superfat would probably affect pH by a small amount but not appreciable amount. But that’s just an educated guess. Hi Anne-Marie, I emailed you with a quick question vie Brambleberry. Thanks! I superfat between 2% and 3%, but the soaps seem really rich anyway. I don't think I'd dare superfat any more lest they ended up feeling actively greasy. I love love love everyone's comments! I've been noticing a higher superfat = higher soda ash for me so I've been at a 3% all summer but now that it's winter, am creeping up to the 4-5% range since I notice my skin needs a bit more TLC in the winter for sure. I love the idea of a 15% superfat for a facial bar! Great explanation! I use 7% for most of my bars, makes 'em super mild, although in summer a little less to prevent rancidity. I usually use %5 as well, as I love a nice thick lather and I also have issues with dry skin. I like the way you explained this – very nice. Thank you so much for the explanation it is surely appreciated. I was taught 5% sf, and I have changed that up a bit 7% in drying winter here and 6% in dry hot summer. Does the video explain when to do your super fatting? Before trace with all oils, after lye is incorporated into the oils, or at light trace? I'm glad to see everyone's opinions on this, it's always interesting! Since I live in Idaho, it's VERY dry in the winter, so I actually use 8% superfat in the winter, and 5% in the summer. We have very dry, sensitive skin, so for our personal use, I superfat at 8-9%. And I love to use fresh goat's milk, that adds to the moisture, without taking away any more lather! Hi Anne-Marie. My name is Claudia from Monterrey, Mexico and your fan!! Congrats for you baby, I think she will be a little sweet girl. I´m a small business owner (www.lacatarinamty.blogspot.com) and I want to start making M&P soaps. I´ve seen all your videos about. Unfortunately, the colors and fragances I´ve found have poor quality. My question is if you have some dealers in Mexico whom I could buy your products? Great explanation AM. It often confuses people, and I still sometimes have difficulties explaining the term. I used 5 or 6% for many years, but lately have been dropping it to 4% to avoid DOS as our humidity here is increasing. I superfat at 5%, though I have tried as high as 8% before. What a great explanation. I used to superfat at 6% for a long time and then switched to my new favourite which is 7%. I like a 5% superfat, too! I'm a lather freak, so don't want too much excess oil inhibiting the bubbles.